One week ago, I arrived in Ho Chi Minh City, fully unpacking my backpack for the first time. It was a surreal experience, but one that had to take place eventually. 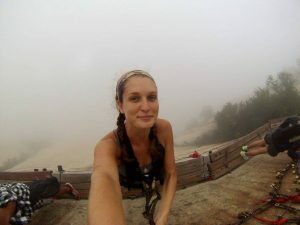 I had grown to love living out of my pack, even if it meant sometimes (or always) wearing a wrinkled t-shirt or getting frustrated because the way things fit perfectly meant having to dig deep for my contacts. It became my home away from home, and packing it – each time with a little something extra – became a relaxing ritual to help me prepare for the next leg of my journey. Since unpacking, I have been introduced to a whole slew of new flavors, taken my first ride on a motorbike (I survived! ), done my first load of laundry not in the sink, and gotten through syllabus week. I have met 16 other American students, as well as 17 dedicated partners from Open University, where we are studying, and countless students at our dorm, all more than willing to help us settle in, find the best food spots, and get involved. Even with the tremendous support from our new Vietnamese friends, it has taken me until the last few days to be confident enough to order street food. I generally feel embarrassed when I cannot speak enough of a language to order what I want and have to use English, relying on others to know my language instead of knowing enough of theirs. So far, though, every local I have met has been kind enough to help me understand the menu, practice my pronunciation, or even show me how to eat local dishes. I always struggle, and we often laugh together, but each encounter gives me more confidence to interact and practice what I know. I have promised myself that come December, I will be able to correctly pronounce and order my favorite dishes. So far, everything has seemed to be going so fast, and yet somehow still slow, but I am enjoying every second of it. Just five days ago I was zipping through traffic on the back of my partner’s motorbike after only a brief “Xin Chao!”, trying to soak in as much of my surroundings as possible while also talking over the noise of traffic. Like every new relationship, especially with my complete lack of Vietnamese language skills and incessant honking from every direction, our conversation started out a little choppy, but before long it felt like we had known each other for years. And, perhaps more exciting than my courses or the amazing view I have of the skyline from my room, in just two days, I will be heading with my partner, Quynh, to her hometown to try some more Vietnamese dishes and do some hiking. Friday cannot come soon enough! Now, you must be wondering what the Silk Road trip is. The Silk Road is a historical trade route between China and Eastern Europe where Chinese silk made up a significant part of the trade. 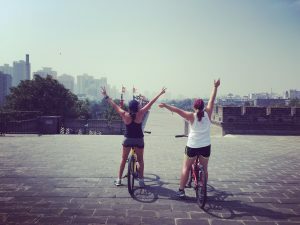 The route ran along many different cities in China and the middle east but since The Beijing Center planned this trip for two weeks, we got to visit a few of them and experienced the vibrant cultures each had to offer. 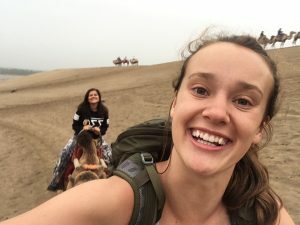 The Silk Road trip was an incredible adventure that I will forever cherish in my heart. I had the opportunity of discovering many cultures, places and people. The amount of new discoveries I got the chance to experience is innumerable and this trip allowed me to see China from a different angle. The most fascinating encounter for me was the Uyghur people who are Turkic-speaking living mostly in northwestern China. When we were in Turpan, a Uyghur family welcomed us to lunch with succulent dishes, oriental music and dancing. I will never forget the barbecued mutton skewers and the juicy baby grapes the area is known for. As a traveler myself, I would have never planned on visiting these areas because they were unknown to me but thanks to TBC, my love for Chinese cultures and heritages has grown even bigger. The Silk Road trip has confirmed my doubts on studying abroad in China. I am an international student myself and leaving home is always challenging and choosing your destination is even a harder decision to make – Am I going to like it there? Am I going to make friends and do well in my classes? There are so many questions and fear of the unknown. Thankfully, my sister who is also studying abroad in China with me has made the transition much smoother. Being on this trip, meeting new people and making friends along the way has solidified my study abroad choice. The TBC staff members are also incredible and have made this trip an unforgettable one. It’s always comforting to have Bill Feng, the trip leader, come up to you with a huge smile and a good morning or his constant request for group pictures in which he smiles while taking the picture. Also, there’s Father Gene who’s always ready to give more insight into the places, the people and the food! Let’s not forget Nick Poche, the Dean of Students, always eager to share his snacks on train rides. I think the people I got to know on this trip made my Silk Road trip experience the most memorable one I had so far. I didn’t want to accept the fact that the trip has ended when we got back to campus because I wanted it to go on but since everything has to come to an end, I mentally prepared myself for the start of classes. It took me a whole day in bed to do so. Who knows how much sleep I’m going to get once exams and papers are due? Might as well catch up with some sleep when I can. The Silk Road Trip has been a very enlightening introduction to my semester in China and it’s all thanks to the amazing TBC staff that made this trip possible. The next time you hear from me I’ll be in Rome; what a great way to start my junior year! I found myself repeating this phrase over and over in my head as I laid on my bed trying to fight back tears. Only forty-eight hours until I would step on a plane and begin my 16-week adventure in Rome, Italy, and these words were my attempt to control my emotions. I don’t know why I was crying—I had just finished a highly amusing episode of Parks and Recreations. But for whatever reason, just as Netflix was about to start the next episode, I began to cry. Don’t get me wrong, I am beyond excited to study abroad. I have been since I submitted my deposit seven months ago. I spent hours sitting in my dorm planning trips and making lists, listening to Italian music, and counting down the days until I would finally be in the Eternal City. But then came August 1, and I saw my departure day lingering in front of me—then lodge itself in the pit of my stomach. It wasn’t until I hit the 10-day countdown that the tears began to slip out. The I-will-be-gone-for-almost-four-months reality finally triggered my inevitable emotions. I spent more time crying then relishing in the excitement of this amazing experience waiting for me across the globe. It frustrated me, yet I couldn’t figure out how to switch my perspective. But these words seemed to work, for now. I was finally able to hold back my tears and relax. It felt nice. The anticipation of studying abroad has its wide range of emotions. There’s a high level of excitement as you pack your bags and look forward to the adventures ahead. 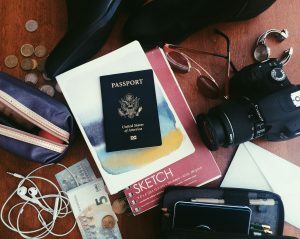 There’s also a lot of stress, nerves, and anxiety—trying to fit your life into one suitcase, preparing for the culture shock, and saying good-byes. Mix all these feelings together, and sometimes the only way to make them all fit is to shed a few tears. But it’s okay to cry. It’s okay to be nervous. To be sad. To worry. To miss your family, to miss your friends. It’s okay to forget a few things at home, and it’s okay to feel a little out of place in your new home. It’s okay to adjust. It’s okay to just be okay. Rome, I cannot wait to meet you. I’m looking forward to all the pizza, gelato, and adventures you hold. I’m nervous to speak your language and adjust to your culture. I’m sure I will miss my family and feel a little homesick at times. But I know it will be okay. It will be more than okay. Ni Hao! I am officially arrived in Ho Chi Minh City after spending six days in China. China was amazing. Very crowded and very hot, but still amazing. The first day (August 17), I arrived in Shanghai after my 15 hour flight, met up with Trenton (my friend from high school) and we caught an overnight train to Xi’an. We almost missed our train, and so my first experience of China was basically sprinting through the train station with my giant backpack. It was stressful, yet invigorating, and we made it onto the train with five minutes to spare. The sleeper train was its own experience. It was actually very nice, and I actually was able to sleep though I was in a cabin with three other non-english-speaking Chinese natives. We arrived in Xi’an the following morning (August 18) and caught the metro to the center of Xi’an where our hostel was. From the moment we stepped off of the metro we were sweating. It was between 95 and 100 degrees fahrenheit the entire time that we were in China (except for up in the mountains). One of the most apparent culture shocks that I felt right away was just how crowded China is. It is very obvious that 18% (1.35 billion people) of the entire world population lives in that one country. I think it is because of this that the Chinese people have a total lack of spacial awareness also. When there are so many people in one place, the idea of personal space is almost at zero percent. This took some getting used to, but by the end of the trip, it was not as bothersome, and in a way, kind of endearing. 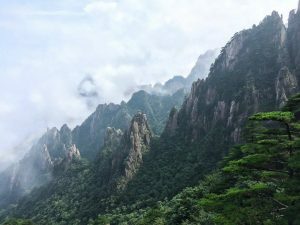 Our plan for our first night in Xi’an was to travel to Mount Huashan, and hike up overnight, so we did not plan on checking into our hostel right away. Though we were not sleeping there the first night, the hostel staff allowed us to leave our bags there, and also shower. This was greatly appreciated, if you are ever in Xi’an, I highly recommend the Han Tang Inn Hostel. After dropping our bags off, we picked up some dumplings (delicious) and took a bus to see the Terra Cotta Warriors. This has been a lifelong dream for me, and I was not disappointed. Although sweltering hot, the rooms of the warriors were huge. We learned that each warrior was actually designed to look like one of the emperor’s slaves, and after a specific warrior was finished, that slave would be killed. The slaves carved their initials into their personal warriors though, so that they could be remembered forever. Also, here’s a tip: view the three excavation rooms in opposite order. Rooms 2 and 3 are not finished being excavated yet, and look more like a few piles of dirt. If you see those before room 1, you are very likely to be underwhelmed. After the warriors, we returned to Xi’an to prepare for our hike up Mount Huashan. We packed our bags at the hostel, and grabbed some delicious biang biang noodles from a nearby restaurant. 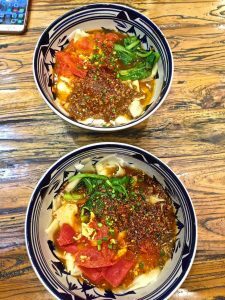 Xi’an is known for these noodles. They are very large, almost like lasagna noodles. They’re also famous for it’s character because it uses 58 strokes. After our noodles, we took a train and then a taxi to the Huashan scenic area. Another culture shock: taxi drivers, actually almost all drivers in China drive like madmen. This taxi ride in particular was one of the scarier ones I have ever taken. Something I noticed as the days in China went on though, was that since everybody drives like a crazy person, you almost feel safer, just because, although I witnessed “almost” accidents about 500 times a day, nobody actually ever hit anybody else. Anyways, I digress; we got to the entrance of the hike around 10:30pm, and began our upward climb. It was still extremely hot at this time, and I was sweating profusely before we even started hiking. I was blown away by the amount of people on the trail. 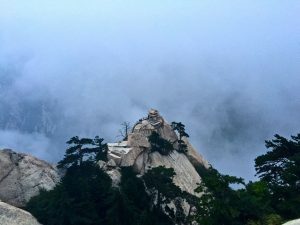 Huashan is one of the top 3 famous mountains in China, but I was not prepared for how crowded the trail was. I guess, even in the mountains, one cannot escape the Chinese crowds. Another surprise was that for the entire time we were on the mountain, we were the only non-Chinese tourists that we saw. China is a big place, and throughout the entire trip, most of the tourists were actually Chinese. The trail up Mt. 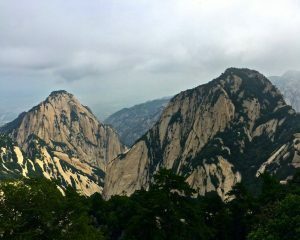 Huashan was entirely paved, and yet it was still the most physically demanding hike that I have ever done, though one of the most rewarding hikes I have ever done. Everything that I had read online said that the climb would take between 3-5 hours. Being a pretty avid hiker, I assumed it would probably take Trenton and I 3 hours. 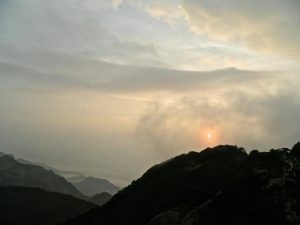 I now realize that the 3-5 hour time estimate was the estimate only for the hike to the North Peak. 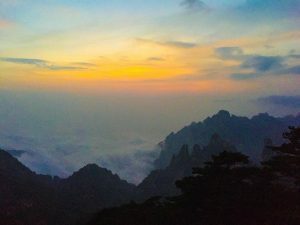 Trenton and I ended up hiking 6 hours to the East peak where the Chess Pavilion is, so as to get the best view for sunrise. So basically we walked up thousands of stairs, some of them more like ladders, for six hours straight. My body was killing me by the time we got to the top at around 4:15am, where we waited for a little over an hour for sunrise. It ended up being too cloudy for a good sunrise, but the view of the Chess Pavilion was dreamy. It ended up being a huge blessing that we spent the night on the mountain, because we were able to beat the lines for the famous plank walk. This part of the hike was basically the reason that I wanted to go to China, and it was everything that I had hoped. I will let the pictures do the talking for this one. We decided to catch the cable car back down the mountain because our knees were hurting just thinking about having to walk down all of those stairs again. By this time, the clouds had cleared though, and the view was incredible. Upon our return to Xi’an, we showered and rested for a bit, and then decided to head out into Xi’an to do some sight seeing. We explored the famous Bell Tower, and were able to get a beautiful 360 degree view of the city from the top. From there, we headed to the Muslim quarter of Xi’an, famous for it’s lively marketplace. It was very interesting gaining insight into Chinese-Muslim culture. 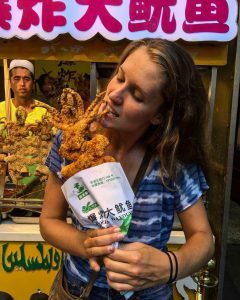 I enjoyed coconut milk and a fully fried squid on a stick, delicious! That night was my first night sleeping in an actual bed since my arrival in China, and I slept like a baby. 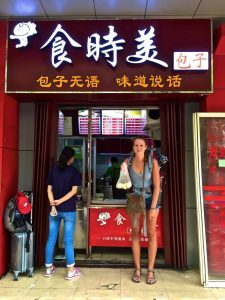 The next morning, we woke up, picked up dumplings from our favorite dumpling shop, and then headed to the airport to catch our plane to Huangshan. 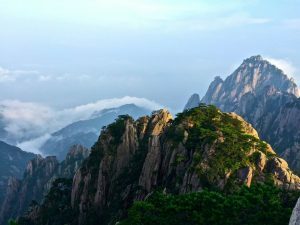 As soon as we arrived in Huangshan, we realized that we were DEEP in China. The owner of our hostel picked us up at the airport, the hour long drive to the hostel was entirely mountains and farm land. The food in Huangshan was very traditional also. We ordered a chicken dish that was basically every part of the chicken, cut up, and cooked in a delicious sauce. When I say “every part” of the chicken, I mean EVERY part of the chicken, feet and head, and beak included. 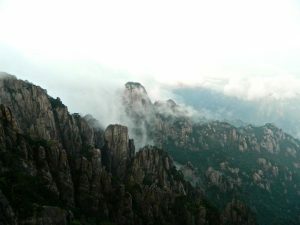 The next morning, the owner of our hostel drove us to the bus that we needed to catch into Huangshan scenic area. The night previously, we had decided that it would be more beneficial to catch the cable car up to the top of the mountain, so as to save our energy for actually hiking at the top, and for the hike down in the evening. Although we had to wait for an hour in line to catch the cable car, this turned out to be a very good idea, seeing as it was over 60,000 steps to the top. 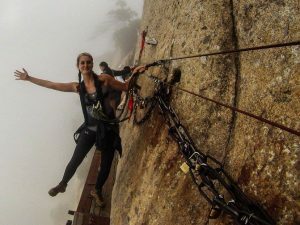 At the top, we were very disappointed by the initial view, as everything was completely covered in clouds. 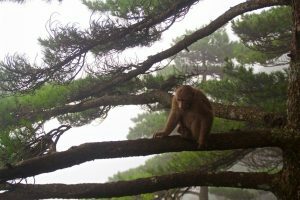 Other than seeing a couple of monkeys, we were extremely dismayed, and I became very frustrated as I had high hopes to see the famed “sea of clouds”. We spent a few hours, getting super excited every time the clouds seemed like they might clear, until finally around 3pm we had our first real view cloud clearing. It was incredible. At this point, we decided that even if we didn’t get to see sunset, the whole trip up the mountain would be worth it. We still had high hopes for sunset though, and so we continued to hike to the point where we wanted to watch it. When we got to this point, it had become cloudy again though, and we again, felt very frustrated. The only excitement was the large number of Chinese people who asked me on multiple occasions to take a photo with them. This was a popular occurrence throughout the entire trip for me, being a tall caucasian, I was a bit of a celebrity. I still wonder where all of those photos ended up. Anyways, we waited at the top of the mountain for about another hour, and finally, around 5pm, we had the most amazing cloud clearance that I ever could have imagined. Honestly, I have seen a lot of beautiful mountains in my lifetime, and these were nothing like I had ever seen before. We were blessed with the sea of clouds, more beautiful than any of the google images that I had spent hours looking at during the weeks leading up to this trip. I still cannot believe that it was real. On top of that, we also had an incredible sunset. It was pretty much the most amazing day. After sunset, we hiked down the mountain in the dark. It took us about 3 hours to walk down 5 miles worth of steep steps, and we felt like we were on some Indiana Jones type of adventure, deep in the heart of China. Finally, we reached the bottom, and caught the last bus back to Tangkou, where we happily showered and sank into our beds. The next day, our plan was to take the bus to Hangzhou. We caught the noon bus, and made it to Hangzhou around 3pm, but to our dismay found that due to the G20 conference coming in September, many of the streets were shut down in an effort to lower the amount of driving on the roads to clear up some of the air pollution. Because of this, it was nearly impossible to get to our hostel by the West Lake, and after a few tries we decided that it would be much more worth it to just go straight to Shanghai. We quickly booked a hostel and a couple of train tickets, and hopped on the next high speed train. This ended up working in our favor as it gave us a full day the next day to explore Shanghai. We were able to spend a couple of hours at the Bund, and walking around the market and eating dim sum where in the area of the city where the houses from the 1930’s are still standing. Pro tip: instead of booking an expensive river tour on the Bund, for 2 yuan, you can just take the ferry across the river, and see the same sights. Also, even though the Shanghai museum closes at 5, they stop allowing visitors to enter at 4, something we discovered six minutes too late. Shanghai architecture is amazing. There is a mix of old and new that is extravagantly more apparent than the same mix that Chicago architecture is famous for, mainly I think because the newer architecture is almost space-like in its modernity. Overall, China was incredible, and I hope to go back soon to explore more. I caught my flight to Vietnam on time, and have now been here for almost a week. A post will be coming soon! Thank you for reading this extra long one! The two weeks spent exploring the more western parts of China was fun, but now it is time to get serious. I am now officially a sophomore! Today was the first day of school and I had two classes. I started the day really early with an 8 a.m. Chinese class, which went pretty well. Although I was a bit nervous since my Chinese level is not were it is supposed to be, the teacher was extremely helpful and positive. Also, I am not a morning person, but the Wang Lao Shi knew how to keep her lessons interactive and entertaining. A couple of hours later, I had my second class: Introduction to Buddhism. Despite the fact that it was a three hour long class, I enjoyed it and learned a couple of new things actually. I just finished the homework for today and cannot wait for my classes tomorrow! There has been so much “Rome” talk these past couple of weeks! I am totally anxious to board my flight to Italy on Tuesday, and it seems impossible that it’s just two days away. After being accepted to study at the John Felice Rome Center last year, I remember thinking August 30th was a lifetime away. Don’t get me wrong… though I am nervous for it to come, I’m definitely excited, too. The only idea I have of what to expect is the advice I’ve gotten from my mom, who recently visited Rome. She has given me her most meaningful tips, including taking an excess amount of black clothing and traveling as light as possible. And while packing has taken up most of my time this past week, I am more focused on arriving in Italia to start checking as many items off my bucket list as possible. Whether it’s in Rome, another Italian place, or a random city in Europe, I’d love to chat up people who actually live there. Talking to strangers is an everyday occurrence in Chicago, and I only hope to carry on the tradition abroad. I can’t really explain why this city is on my list, but ever since I have observed other students abroad visiting Paris, it has been making its way to the top of my list. Perhaps it is there because it contains the world’s largest art museum and monument, the Louvre. Something about it has always intrigued me. When I tell people that my 21st birthday will occur while I’m abroad, they seem sort of sad for me, since the drinking age in Rome is 18. Ha! You all just wait. I have something big planned. I am obsessed with arts and music!!! My love for the two happens to be a huge reason that I chose to study in the first place. Today, I purchased a couple of small drawing pads and watercolors to push me to sketch and paint while I’m there. Don’t worry; I’ll post pictures of my artwork, too! Whether it’s an Italian dish or some Italian language, I can’t wait to share something foreign with friends and family once I return. I hope it ends up being food, to be honest! Rumor has it, the Chainsmokers will be performing in Milan during the month of October. For those of you who don’t listen to EDM, just know, they would be an AMAZING one to go to. I did mention I turn 21 in a month right? Also, who doesn’t love ice cream and coffee? Well, you know I had to put something touristy on here? The Colosseum and Trevi Fountain are pretty much a given, but visiting the Vatican City is always something I’ve hoped to experience, as well! Besides, my grandma MJ would kill me if I didn’t at least try to see Papa Francisco. I am a 20-year-old, after all. I absolutely have to experience the nightlife. Discoteca, anyone? This was a tip from the SLAs, to really get to know the neighborhood we live in as well as the rest of Rome. Even though I plan on traveling to much more than just Rome, I’ll definitely spend some quality time wandering around local shops and plazas. After reading this bucket list aloud to my parents, they seemed slightly worried that the next four months sounded like just a vacation. “You are taking classes, right, Molly?” To justify the “study” in “study abroad,” and to put my parents at ease, know that I will be taking some awesome classes, too! If you have any tips for traveling or any specific spots I absolutely have to visit while there, email me at mketterer@luc.edu. I can’t wait to cross every one of these off my list, mostly so I can share this craziness with you all via blog. See you on the other side! The beginning of my journey did not start in Beijing. It started back home when I was working on my application to study abroad. Since the time I sent in my application, it has been an emotional rollercoaster. Don’t worry, this is one of those rollercoasters that you want to ride again and again. The beginning is the toughest and most unclear part of adventure stories. Why is it, you ask? In the beginning, I didn’t quite know what to expect the rest of the story to be like. I was anxious and confused. 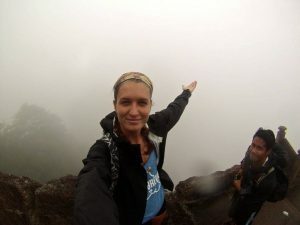 Doubts and fears about studying abroad constantly ran through my head. Will I survive not seeing my family? Will my friends back in my home university forget about me? When I return home, will it still feel like home? Will I be able to make friends? What if I get too homesick? Am I really ready to do this by myself? Is this experience worth it? Did I make the right choice? Will this experience truly be as great as they say it is? During my 13-hour flight from Chicago, I was not only feeling anxiety. I was also excited and I had butterflies in my stomach. My dreams of traveling and studying in China were finally coming true. I was thinking about seeing the Forbidden City and visiting the Great Wall. I imagined myself eating dumplings at a cute café on campus with my news friends and I tried to picture myself riding camels in the middle of the desert, sweating under the burning sun. I realized that the questions I asked myself were only breaking me down, preventing me from discovering my full potential. My heart was testing me and I was overthinking the cons. But I was on the same emotional rollercoaster like everyone else. I realized that this buildup of emotions and anxiety was all normal. Regardless of all the good things, I can’t help but feel alone and lost like everyone else. At the end of the day, I have myself and my thoughts. I think being lost is a good thing because I am given the opportunity to find myself (very cliché but totally relevant and very true). I put my heart at ease and thought about how my life will be changing for the better. One of my goals through studying abroad is to learn new things about the world and myself. I can’t accomplish my goals if I am afraid of the journey that is required to achieve them. When I entered Loyola, I was determined to do a semester abroad in Beijing my sophomore year and here I am. I wanted to take my own unique route and decided to take on the challenge. In summary, don’t let your fears in the beginning take control of you. If you get scared away too early in the game, you will miss out on what probably will be the greatest adventure of your life. Just go with the flow and everything will be alright. I hope you all find the courage to take on this challenge one day like I did. Be the person who says they want to travel and actually do it. This is only the beginning and I am so excited to share with you my experiences! Stay tuned for my adventures in detail real soon! I was inspired by my best friend’s article that she wrote for the Odyssey. I don’t know where I would be without her words. She always gives me strength and always gives me support. Read her beautiful article [here]. China so far has been amazing! These past two weeks especially have been filled with adventures that taught me a lot about this beautiful country and the fellow students I have had the opportunity to share this experience with. I enjoyed every single moment of the Silk Road trip and will definitely not forget these two weeks spent exploring a very different side of China and meeting new people. 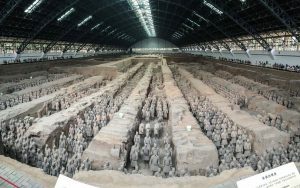 Our first stop was Xi’An, a city with a history even more complex and ancient than Beijing’s. We saw the Terracotta warriors as well as biked on the Great Wall of Xi’An. The view from the wall was breathtaking and totally worth the sweating and having an aching body the next day. After a couple of days in Xi’An, we headed to Xia’He, where we learned more about the Tibetans. A Tibetan family generously hosted a dinner for our group, which was delicious and pretty entertaining! After drinking yak milk, eating yak meat, we were offered rice wine and were presented with a hada (a long cloth worn as a scarf). We then danced and sang. It was beautiful how we were still able to have an amazing time despite the language barrier and our different cultures. The following day, we went to the Labrang monastery, where we observed some devout monks and Buddhists perform their daily rituals. We also went on a tiring hike for an hour, but once at the top, we were glad we made it. That second night, we went on a picnic and ended it by dancing around a bonfire and partying with the Tibetan nomads again. Next stop: Lanzhou. Unfortunately, I was sick for the whole time we were there and missed out on our visit to the Gansu provincial museum and the noodles that this city is most famous for. On our way there, however, we stopped to visit the beautiful Linxia Sichuan Mosque. We also saw the schools near the mosque and interacted with some of the children. Dunhuang was our fourth destination. We were all pretty tired and sick by that time, to be honest, but we were all also very excited to camp and ride camels. To start the day, I, and probably most of the other students, had the best breakfast of our lives. On the rooftop of a hotel, with an extraordinary view of the sand dunes, and a buffet, we were ready to start the day! Soon enough though, it started raining. Yes, in the desert! Our tour guide told us that it was the first time in several years since it rained in Dunhuang. We were all extremely disappointed when the camping/bonfire/watching the sunrise plans were cancelled. We still went on the camel rides though, which was truly an adventure! Getting on and off a camel was actually way harder than I imagined. 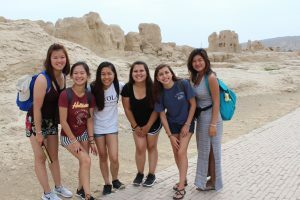 We then travelled to Turpan and explored the Jiaohe Ancient City Ruins under the burning sun, but once again, it was all worth it in the end. A Ughyur family then welcomed us with some really tasty food, including grapes. They also danced and sang to their traditional music and of course, we joined them! 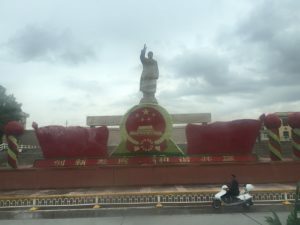 The Silk Road trip ended in Kashgar,a beautiful city known for the giant statue of Mao that stands at the center of it. As planned, we went to Aba Khoja Mausoleum as well as the Id Gah Mosque. What I really enjoyed about this city though, was the bazaar and the old city, which makes it completely different from the rest of China. I also loved the ferris wheel and the paddle boats, which made the last day a relaxing one. TWO UNFORGETTABLE WEEKS is how I would best describe this trip. Hello from sleep deprived me. We just finished our 13 day trip across China to follow the Silk Road, which I have to say was one of the coolest trips I’ve ever taken. I don’t think I ever would have traveled 2 hours from the Pakistan border on my own. Getting to Kashgar is also a story of it’s own. We got to the train station in the middle of Turpan, only to find out that there was a sand storm and our train was indefinitely delayed. The only hotel nearby was in my opinion rated a half of a star, but we stayed there anyways. My roommates pillow was yellow, and my bedframe was completely broken. Safe to say, I sat on the steps outside of the hotel from 7pm to 1 am. At 3am, we were woken up to get on our 16 hour train, and proceeded to spend the next 16 hours on an overnight train to Kashgar. 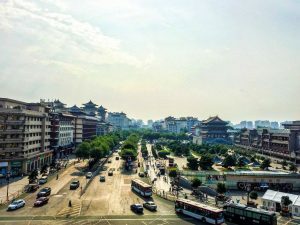 Xi’an: Bustling city with Muslim Street. Great for bartering (I’m getting really good at it). Here we biked on the city wall and went to see the Terracotta Warriors. Lanzhou: Famous beef noodles, though we ate them for breakfast – still getting used to eating non breakfasty things for breakfast. Also my birthday was here. We went for hotpot (accidentally got spam and vegetarian chicken), tried to go to a music bar which ended up being another hotpot restaurant, and then went to a pub. Xiahe: See my previous post about Tibet! Turpan: Where we discovered real NAAN. As a bread lover this is the best discovery ever. Kashgar: Giant Mao statue and second largest Bazaar ever. Also lamb kabobs – these will now be a thing when I return. I didn’t think I would like lamb. Also since I said I’d try everything, we tried Lamb feet, safe to say I’m not a fan. And now about the title of my blog – On the 6 hour plane home, I dumbly chose to sit in the middle seat so I could sit by my friend. Of course, a random person sat in the aisle seat. I have no problem sitting next to strangers, however I do have a problem if they sit in my part of the seat. This man was lounging so hard that he was half in my seat and I was not having it. So we were at war the entire plane ride to claim the armrest and everytime he’d get in my space I’d gently nudge him back. Also, I enjoyed making the flight attendant laugh because everytime he’d ask me if I needed something in English I’d respond in Chinese and it’d catch him off guard. After spending hours on buses and trains, I feel so close to the 40 people in this program. Now that our main travel throughout China is done and classes are about to start, I can finally focus on getting routine back, and my Instagram won’t be as crazy. SIDE NOTE: If you texted me on my birthday I didn’t get it because I didn’t have my American SIM card in a phone. Message me on WeChat or What’s APP or facebook if you wanna talk (LOL).